Arctic seems at first to be the latest in a long line of films about one man, alone, attempting to survive in a pitiless environment. Unlike All is Lost (2013), which pitted Robert Redford against the ocean, or Cast Away (2000), which pitted Tom Hanks against a desert island, Arctic pits Mads Mikkelsen against the frozen wastes. Director/co-writer Joe Penna walks us through Overgård's (Mikkelsen) daily life: clearing snow and white rocks from a 20-foot-tall "SOS" he has etched into the frozen tundra; checking to see if the fishing lines he has jury-rigged by cutting through the ice have caught anything for him to eat; operating a hand-cranked radio signal on a hilltop in the hopes of attracting the attention of rescue teams; and taking shelter in the fuselage of his wrecked airplane, bundling up underneath thermal sleeping bags and trying to keep (any more of) his toes from falling off. All the while, Overgård's watch beeps every so often, signaling a shift to the next task. It's that schedule that keeps him sane, that urgent beeping that keeps him going. Penna's camera captures the washed-out sameness of Overgård's environment, the endless white and the bitter cold and the pale fish flesh all mingling together into a maddening mishmash of hopeless bleakness. And yet, he keeps going, like clockwork. But clocks don't really go anywhere: they turn in place, winding up in the same spots at regular intervals. He is surviving, nothing more. In a land that inhospitable, survival is no guaranteed thing. He needs a reason to get moving, to get going. And so, Penna gives Overgård a reason: a young woman (Maria Thelma Smáradóttir) whose helicopter crashes during an attempted rescue. Wounded in the crash, she needs medical attention or she will die. Arctic is a fine showcase for Mikkelsen (do not confuse this minimalist film with the heavily stylized hit-man action-comedy Polar, also starring Mikkelsen, out now on Netflix), who veers between stony competence and heartrending empathy as the film progresses. Those who enjoy actors working a high level on the big screen will find much to love here. However, Arctic is more fascinating as a study of the creation of society on a micro level, of the things we do for each other for no reason other than our shared humanity and the meaning we find for ourselves in helping each other. One small, nice touch: Overgård grabs a photo kept by the injured woman of her family—husband, small child—in the cockpit of the copter. He places it nearby so she can see what there is to fight for, why she needs to stave off infection and keep going. But the photo is not for her, not really. It's a lifeline for Overgård, a reminder of what exists beyond the snow and ice, a final, fragile tether to the society to which he so desperately hopes to return. And, for a misanthrope such as myself, it's a useful reminder that man's status as a social animal—an animal that craves and creates community—cannot be denied. Cold Pursuit is a fascinatingly odd little film. It's being sold as Taken, but with a Snow Plow Driver—and it is that, kind of. 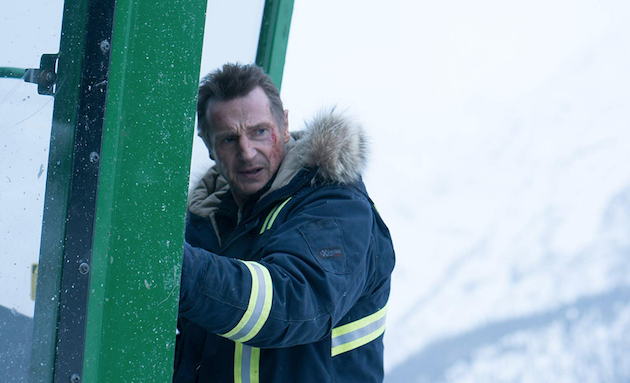 Nels Coxman (Liam Neeson) drives a snow plow. His son is killed by drug dealers. Coxman wants revenge for his son's death, so he kills a bunch of Viking's (Tom Bateman) underlings. Pretty straightforward, right? Well, yes and no. There's also a subplot involving a gang of Native Americans, whose patriarch, White Bull (Tom Jackson), is also seeking revenge against Viking, given Viking's choice to kill White Bull's son after Viking guesses that the natives are responsible for Viking's men going missing. So, it's kind of like Double Taken? But then there's another father/son thread running through the film, this one involving Viking and his boy. Viking wants to toughen him up (he considers "Lord of the Flies" an instruction manual) and demands the boy maintain a strict diet of lean proteins and vegetables—better than the lines of coke Viking's father fed him. Viking's son finds himself in danger following the choices made by his father—choices that stem from choices made by Viking's father before him. There's a weird, wry sense of humor running through Cold Pursuit, an almost aggressively regressive brand of yuks that consistently made me giggle. The drug-dealing villain is a Tesla-driving psycho who rails against the dangers of high fructose corn syrup, for instance. There's also some dry word play, like the one-liner where one of the Native Americans tells another Native American to get rid of a body. She snorts, saying she's busy, and nods her head at one of their employees, an Indian-American: "Tell the Indian to do it." So Cold Pursuit is like several Takens in one, but much funnier and much stranger, more muted, less driven by righteous rage than by a sense of how communities come apart at the seams. Community ties span the generations; they are temporal as well as physical. Sons pay for the sins of their fathers in this film, and not just the fathers we see, but fathers long dead. 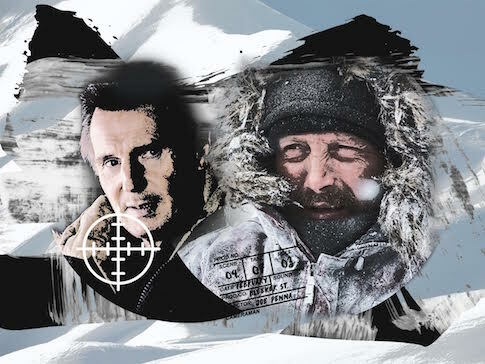 If Arctic is about people coming together and finding purpose, Cold Pursuit is, at least in part, about the ways in which communities self-destruct, about the fragility of those time-and-distance-spanning threads that connect us all. Cutting one strand of that community—in the case of Cold Pursuit, ending the life of Nels Coxman's son—causes the whole thing to unravel, like a quilt pulled apart. And when things fall apart, they tend to do so quickly, and in unpredictable ways. No one can claim surprise when the bodies start to hit the floor.